If your laptop, smartphone, or other mobile device is stolen, there are security apps that can help you locate it. Some can take a picture of the thief. A few can even sound alarms or allow you to remotely erase sensitive data stored on a stolen device. In a recent case in California, a taxi driver was nabbed because the owner had installed software on his Apple Macbook that was able to track the location of the device and silently take pictures of the laptop thief. Of course, you have install the security app of your choice before the theft occurs. Here are some of the best apps to help you recover your lost or stolen laptop, smartphone, or other mobile device. Hidden is for those with Apple Mac computers, iPhones, and iPads. It relies on Apple's CoreLocation technology to pinpoint the location of your mobile device. Combined with the iSight app, Hidden can snap photos of a thief via your device's camera and email them to you. Screenshots of computer usage can also be emailed so you can see what's being done with your machine. Hidden is free to try for 7 days, and subscription plans start at $15/year. Prey is a cross-platform tracking app that runs on Android, Windows, Linux, Mac, and iPhone/iPad devices. Prey provides location data, Webcam, and screenshot reports. Different versions take advantage of different platforms' location capabilities. For example, Prey on an Android phone communicates with its owner via SMS messages. Prey can make your lost or stolen device sound a loud alarm or display a message onscreen. It can also lock down your device or wipe stored passwords, via remote command. The free version supports up to ten devices. Tiered subscriptions are available for larger pools of devices. Where's My Droid is a simpler device for lost Android phones. It has the ability to sound your ringer at maximum volume, even if your phone is on silent mode. Perfect for those frustrating "I'm late for work... where's my phone?" moments. LoJack for Laptops is for Mac OS X and Windows 2000 or higher laptops. Once the CompuTrace app is installed, your computer is traceable even if the hard drive is wiped. Standard and Premium subscription plans are offered starting at $40 per year. 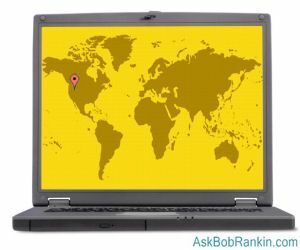 With Standard plans, only IP address locations are available. Premium plans use hybrid positioning to provide more accurate location data. The company's Recovery team will work with local police departments to recover your lost laptop. The company has a pretty impressive guarantee: If you use the Premium Edition, and they cannot recover your stolen device, they’ll give you up to $1000 to purchase a new one. GadgetTrak is available for Mac OS X, Windows, iOS, Android, and Blackberry devices. Security and location capabilities vary depending on the platform. On laptops, Gadgetrak uses WiFi hotspot triangulation to estimate location. On iOS devices (iPhone and iPad), GadgeTrak provides location reports, camera support, and a hybrid of GPS, WiFi, and cell tower positioning. On Android and Blackberry devices, GadgeTrak provides hybrid positioning, remote data wipe, SIM change detection, and a piercing alarm that can be activated remotely. Annual subscription plans start at $20. LockItTight is only for Windows and Android devices. It provides keylogging capability in addition to screenshots and location reports. Keylogging may be very helpful in recovering your laptop because the thief may brag, log on to his Facebook page, or otherwise type something that provides a clue to who he or she is. LockItTight is free for one device. Monthly subscriptions for more devices range up to $4.99. File a police report as soon as your device is stolen. Explain to the police how your tracking software can help them locate and apprehend the thief. It will help motivate them to pursue what might otherwise be deemed a low-priority case. For more tips specific to lost or stolen cell phones, see my related article Find a Lost or Stolen Cell Phone. Most recent comments on "Locate a Stolen Laptop or Smartphone"
No matter how vigilant you are there's a time when you're not looking. Chaining the gadget to one's body is not an option mmost of us are willing to consider but it works. I propose an app that makes the gadget spray an indelible ink (like banks have for robberies)or emits an overpowering reek of wondorous preportions when triggered. On second thought, the jerks around us would be striving to trigger those responses for a laugh, or they could go off by accident. This is not very glamorous, but it will help if you lose your device - put a sticker with a phone number on the device. If a good Samaritan finds it, they can call you. We've had a cell phone & a camera card returned to us (it was my husband's fault - he was supposed to protect that camera card with his life.....). phone, and it works very well. Prey's free version is only good for 3 devices. More than that you can use the pay version. A STOP Plate may be more "glamorous" as Stephanie said .. I have one and i like the idea if someone honest find it, I'll get it back.